James M. Wilson, M.D., Ph.D. The failure of the adenovirus Ad5 vaccine in the STEP study, halted in 2007, sparked renewed interest in developing antibody-based, rather than T-cell-based, vaccines against the AIDS virus. However, HIV evolves so rapidly that developing a vaccine formulation eliciting the necessary breadth of antibodies against the virus has proven difficult. The challenge of an antibody-based approach is that the antibodies which form against HIV antigens are not broad enough to protect against the diversity of HIV isolates. Some laboratories have successfully cloned B cells, including their antibody genes, from HIV-infected patients whose disease had not progressed. They found that the antibodies from these B cells bound to a portion of HIV that broadly neutralized against many HIV isolates. While the cloned antibodies could potentially prevent HIV if expressed in humans, this approach would require frequent reinjection, as antibodies degrade over time. The required regimen is also expensive and difficult to adhere to and simply not possible in developing countries where an effective HIV vaccine is most needed. A few years back, the Bill & Melinda Gates Foundation approached the Gene Therapy Program at Penn about leveraging its experience in adeno-associated virus (AAV) vectors to develop a method for delivering antibodies against HIV. Philip R. Johnson, M.D., a professor at The Children’s Hospital of Philadelphia, showed success with the approach in a study published in 2009 in Nature Medicine. Dr. Johnson’s team created immunoadhesins designed to bind to simian immunodeficiency virus (SIV) and block it from infecting cells. SIV-specific immunoadhesin DNA was engineered into AAV carriers for injection in monkeys, where the DNA produced high systemic levels of the immunoadhesins. 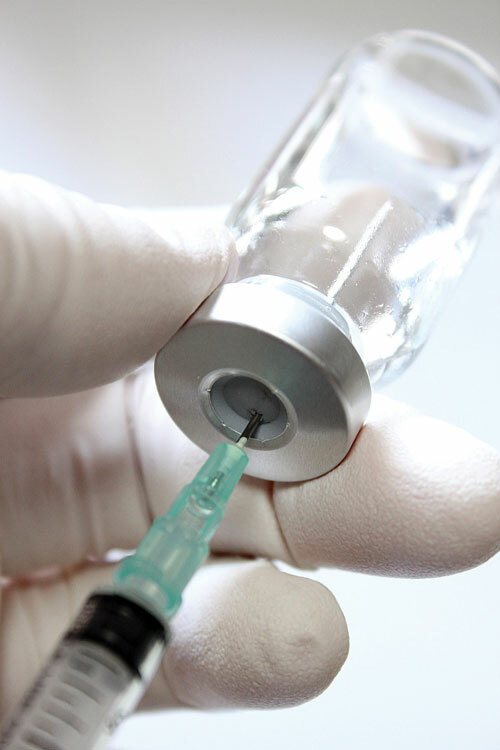 Most immunized monkeys injected with live SIV were completely protected from SIV infection, and all were protected from AIDS. Unimmunized monkeys were all infected by SIV, and two-thirds died of AIDS complications. The Gene Therapy Program was asked to assess the feasibility of this technique using a new generation of AAV vectors developed in my laboratory. Our initial work focused on HIV but at the encouragement of the Gates Foundation we began to consider applications of AAV vectors as countermeasures for pandemic respiratory infections such as those caused by influenza viruses. Initially, research focused around seeking a broad neutralizing antibody, inserting it into an AAV, injecting it in the muscle, then programming the muscle to produce large quantities of the antibody, which circulates in the blood to prevent the virus from spreading upon infection. That was a nonstarter, given the substantial safety considerations. The cells would express the antibody for about a decade, based on monkey experiments, which is fine if it was efficacious and safe. However, there is no mechanism for turning off expression of the antibody gene if its expression was no longer needed, or became toxic. An insight came from an unlikely source—the ABC-TV reality series “Shark Tank,” where a contestant pitched a transparent filter for preventing infections from what people inhale. The emphasis was on the importance of preventing the infection at the site where it is transmitted, i.e., the nose and proximal airway. We reviewed the literature on the pathogenesis of respiratory viral infections, which indicated that the initial site of infection is proximal (i.e., nasal, oral, or tracheal). Further progression of the disease resulted from the spread of virus into the lung through aspiration. We focused on pandemic influenza, given its acute importance. Other investigators identified a broadly neutralizing antibody, FI6, against the virus that, if expressed at the right place and concentration, could block all forms of pandemic flu that we would envision ever emerging. The problem with seasonal influenza vaccines is that they are only good for that season and very specific in activity. As a result, researchers would have to guess the flora of influenza that’s going to emerge each season. The 2009 H1N1 pandemic showed that the time it takes to generate, manufacture, and distribute a traditional vaccine is too long. We cloned the FI6 gene into an AAV9 vector, which was aerosolized into mice to achieve expression in the nasal or pharyngeal area. Our initial test used a mouse-adapted strain of influenza, aerosolized into vector-treated mice, which showed complete protection. We then tested this vector treatment in mice against a broad range of influenza strains, focusing on those isolated from past human pandemics. Working with Gary Kobinger, Ph.D., chief, special pathogens at Public Health Agency of Canada and a former postdoctoral fellow of mine, the program obtained isolates of previous H5N1 and H1N1 influenza, and a reconstruction of the 1918 H1N1 virus based on archived human tissue samples. The animals were administered the vector and sent to Dr. Kobinger, who brought them to his BSL-4 lab. We showed substantial efficacy against all isolates. In most cases, the animals survived if they recieved our vector, but died if they didn’t. Finally, we tested the vector on ferrets with one H1N1 and one H5N1 clinical isolate and showed the same efficacy. We envision two possible applications. One approach is to test the current vector for safety and efficacy in humans, and to stockpile it for rapid deployment in the setting of a pandemic. The other is to include in the vector a second antibody effective against influenza B, for possible development to prevent seasonal flu, at least in high risk groups such as elderly and immune-compromised patients. The vectors also present a practical, affordable platform for expressing biologics against infectious agents, and chemical and biologic weapons. We are working with the U.S. government in evaluating this approach as a generic countermeasure for bio-threats. Using the same carrier and vector, you can attack several diseases by just introducing one or more antibody gene “cassettes” into the vector. Finally, this example illustrates how the tools of gene therapy which are currently being deployed in the clinic for the treatment of genetic diseases, have potential in many other settings. James M. Wilson, M.D., Ph.D., is professor and director of the gene therapy program in the department of pathology and laboratory medicine, and professor in the department of internal medicine at the University of Pennsylvania. He is a consultant to ReGenX Holdings, and is a founder of, holds equity in, and receives a grant from affiliates of ReGenX Holdings. In addition, he is an inventor on patents licensed to various biopharmaceutical companies, including affiliates of ReGenX Holdings.